How I wish I could give you better news about child abuse in Australia but I cannot. Simply put, the latest tranche of national statistics shows that we are not going in the right direction. Earlier this month the Australian Institute of Health and Welfare issued Child protection Australia 2015-16. 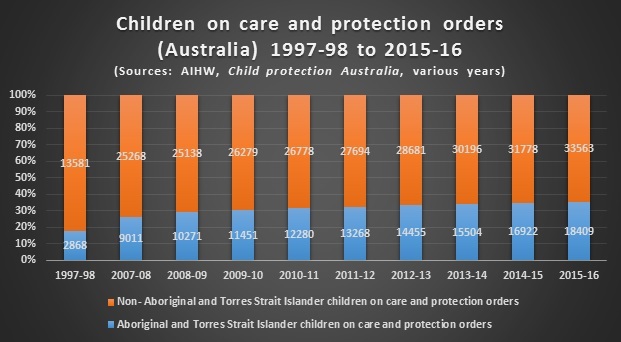 The following charts highlight trends on key fronts, from child abuse substantiations, to the number of children in out-of-home care, and the proportion of Aboriginal and Torres Strait Islander children on care and protection orders compared with children from non-Aboriginal and Torres Strait Islander backgrounds. I think these charts speak for themselves: clearly we continue to face a major national problem. 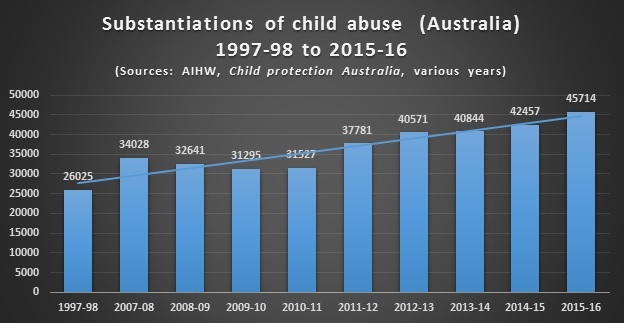 Amongst the ‘green shoots’, however, is the growing attention that responding to child abuse and neglect is being given in the work of Commonwealth, State and Territory Governments and the non-government and research sectors. The National Framework for Protecting Australia’s Children 2009-2020 is one of the central planks of this response. The National Framework’s Third Action Plan 2015-2018 is making an important contribution, especially in emphasising early intervention and prevention approaches. The Royal Commission into Institutional Responses to Child Sexual Abuse, whose final report is due in mid-December this year, is another key response to child abuse and neglect through its rigorous analysis of the issues in historical and contemporary senses. It is also encouraging to see a number of non-government initiatives taking root. These include the important SNAICC Family Matters initiative which draws attention to the over-representation of Aboriginal and Torres Strait Islander children and young people in out-of-home care and the Valuing Children Initiative which aims to focus community and political attention on the importance of valuing children far more than we do as a society. Finally, having convened workshops involving non-government and government representatives over the past month in several capital cities, I have been struck by a shared determination to expand collaboration in order to improve child safety and wellbeing. A key message from these forums is that we need to stay impatient for change while recognising that we are doing longer-term work of shifting large policy and programmatic systems, strengthening families and turning around adult behaviours. 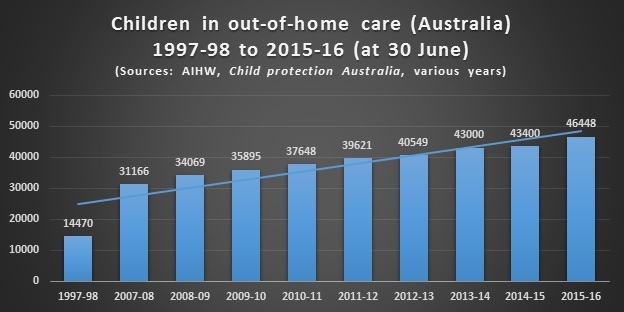 Australian Institute of Health and Welfare (2017), Child protection Australia 2015–16, retrieved from <http://www.aihw.gov.au/publication-detail/?id=60129558626>. Council of Australian Governments (2009), Protecting Australia’s children is everyone’s business: National Framework for Protecting Australia’s Children 2009-2020, retrieved from <www.dss.gov.au/our-responsibilities/families-and-children/publications-articles/protecting-children-is-everyones-business>. Commonwealth of Australia (2015), Driving change: intervening early. National Framework for Protecting Australia’s Children 2009-2020. Third action plan, 2015-2018, retrieved from <https://www.dss.gov.au/sites/default/files/documents/12_2015/pdf_third_action_plan_for_protecting_australias_children.pdf>. Secretariat of National Aboriginal and Islander Child Care (2016), The Family Matters Roadmap, retrieved from <http://www.familymatters.org.au/wp-content/uploads/2016/11/TheFamilyMattersRoadmap.pdf>. ‘Valuing Children Initiative 2017’, retrieved from <http://valuingchildreninitiative.com.au/>.